If you are looking for a trimming machine to increase your efficiency while harvesting your buds, look no further than Twister Trimming machines. When timelines and stress are pressing you come harvest time, put your trust in the best. Twister trimmers have made a name for themselves by consistently providing hobby and commercial growers with the most dependable and fastest trimming products on the market. Their trimming machines have been surgically designed to give you the quality, speed, and reliability you deserve. Make this harvest your best one yet. What sets Twister trimmers apart from the competition? Twister has spent the past 10 years honing in the science behind their trimmers. Quality is in their DNA, and their return rate reflects this (less than .5%). They offer the fastest operating trimming machines in the industry, cutting days or weeks of trimming into a matter of hours. A fast trim is good, but a high quality trim is better. 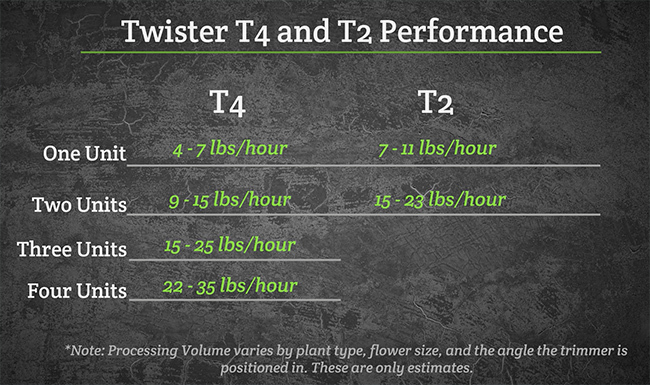 Twister trimmers preserve the flavor profile and potency of your flower, with their trademarked SoftTumble technology. Hydrobuilder is a diamond elite dealer for Twister Trimmer. We've been trained extensively on these products and will help you find the right machine for your grow. Can't find the Twister replacement part you're looking for? Don't worry, Give us a call at 888-815-9763 and we will help you find the right part. Here at Hydrobuilder, we also carry conveyor systems and rails for optimizing your harvest trimming process. You can also find all Twister parts and accessories you may want or need here. If you want to learn more about some of the most popular Twister Trimmer products, check out our reviews of the T2 and T4 trimming machines here. Want to learn about other awesome trimming machine brands? Take a look at our review of the top trimming machines of 2018-2019. Twister is one of the best brands in this industry, but they aren't alone! Find other popular brands like CenturionPro, Triminator, and more here in our full trimming machines category!